Bone marrow with pickled kumquat, cilantro, radish, and sweet sauce. This is what people who don’t know about BISq ask when they first hear about the place. The restaurant, from the team behind the nearby Bergamot, does have a refreshing green gazpacho, as well as a corn bisq-yoo-ee. But BISq stands for “Bergamot Inman Square.” There is a rule in newspaper headline writing that a pun must work both as a joke and literally — otherwise don’t use it. This should apply to restaurant names, as well. In actuality, BISq specializes in wine and small plates, with an emphasis on charcuterie. The restaurant is convivial and relaxed. One can drop by for a snack and a glass, or settle in for a few bottles. It is such a fine neighborhood hangout, a person might consider relocating to make it hers. What BISq and Bergamot have in common: an operating team of owner Keith Pooler, general manager Servio Garcia, and wine director Kai Gagnon. Dan Bazzinotti, formerly of Bergamot, is executive chef. The hospitable feeling of the first restaurant also carries over, but at the new place things are looser. The experience feels less like being waited on, more like attending a mellow party where some of the guests happen to know a lot about beverages. This is particularly true in the intimate back room, with a cozy bar, a low-lit nook in a deep shade of butterscotch, and a chandelier made from wine bottles. When strangers snuggle up, chances are good they will wind up talking and drinking together as the night wears on: strangers no more. BISq’s front is a long, slender space lined with wood boards, eggplant and slate-blue paint, and gray brick; there are communal tables at the front, a counter that overlooks a kitchen on one side, and a single row of tables on the other. The menu feels as easy as the atmosphere — an assortment of cool raw fish dishes, compositions of seasonal produce, a couple of pastas, and the charcuterie that is Bazzinotti’s specialty. That’s not to say the food is simple. It is thoughtful, pretty, filled with contrasts in flavor and texture. A tiradito, the sashimi-esque Peruvian dish, combines thin slices of salmon with tiny cubes of purple potato, along with accents of the Peruvian chile aji amarillo and crisped quinoa. It’s elemental — water, earth, and fire — and the colors pop. Prosciutto-ized tuna, dense and saline, lands on a plate with watermelon, puffed black rice, green goddess dressing, and fennel pollen, a vivid mix of flavors, textures, and hues. 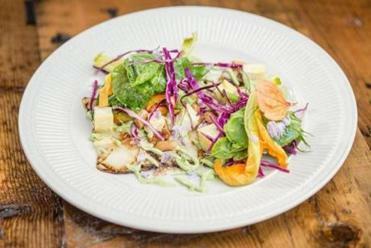 Seafood dishes aren’t all fresh and light. One of my favorites is the N’awlins barbecue shrimp toast, a rich mash-up of Louisiana classic and Chinese restaurant staple. Orecchiette with chicken sausage, baby artichokes, broccoli rabe, bechamel, and sweet pepper jam is just one ingredient too busy. I hope the more pared back lemon corzetti with peas, leeks, and cremini mushrooms returns next spring. Some of the loveliest dishes here are vegetarian: a salad of heirloom tomatoes with house-made burrata, sweetened with lashes of tomato molasses; a carpaccio of king oyster mushrooms with cabbage, peanuts, and omelet, a crunchy Asian slaw that occasionally floats off into reverie with fluffy bites of egg and fungus. Peaches are grilled, summer sugar and smoke, then plated with house-made ricotta, salt-roasted turnips, basil, and pistachios. Of course, you could also add excellent house-cured culatello, made from the back leg of the pig, the equivalent of the heart of the prosciutto. And charcuterie is the heart of the menu, a third of it devoted to pates, sausages, and terrines — from Betty’s mazzafegati (“remembered from the North End”), a pork-liver sausage scented with spices and orange rind, to whipped lardo spiced with ancho chile and paired with strawberries and shortbread crumble. The Bazz hook-up board, an assortment, is the most direct way to experience a range of options. But though charcuterie is clearly the restaurant’s pride, it is the most uneven segment of the menu — here a pate en croute that is too much croute, too little pate; there chicken rillettes “on a log,” spread in a celery stalk a la ants, clever but tasting uncannily like tuna salad. The misfires tend to disappear from the menu quickly. Even the meatiest fare at BISq feels balanced, brightened and lightened, by accompanying flavors. 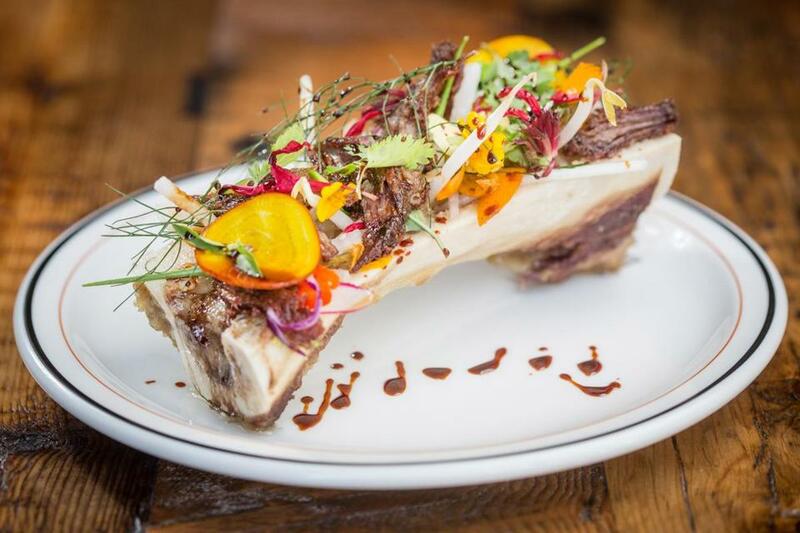 Bone marrow is crowned with pickled kumquats, cilantro, radish, bites of short rib, and sweet, soy-based kabayaki sauce. Lamb ribs are complemented by cherry glaze and green garlic chermoula. Pork belly sliders, however, provide too much fat for salsa criolla and avocado to slash through. BISq offers two desserts, just the right amount for a place where sweets are not the focus. Would that more restaurants felt comfortable doing the same. The trifle can be pleasingly sweet and simple on some occasions, as with one composed of brownie with cheesecake and whipped cream. In other versions, such as pineapple and ricotta with olive oil cake, the flavors don’t come together as they should. 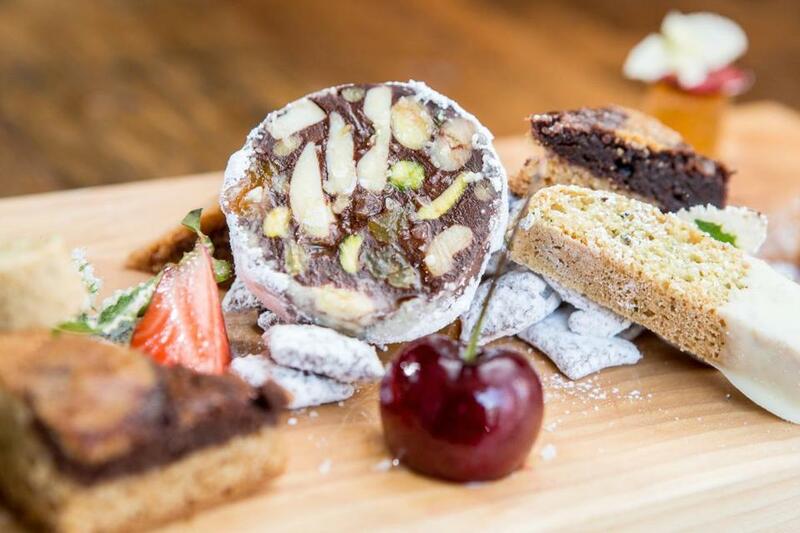 The winner, consistently, is the dessert charcuterie, a board that offers the likes of chocolate “salami,” pates de fruits, biscotti, caramel corn, and Chex Muddy Buddies. It is tasty, clever, and fun to eat. One of the main joys of visiting BISq is the chance to talk wine with the knowledgeable Gagnon. His focus is regional — featuring France, lingering in the Loire, venturing occasionally to Germany and Austria. There is a fine selection of beer, as well. Wisdom isn’t just being dropped on inquisitive customers. Everyone working at BISq knows the wine as well as the food. Despite all of its strengths, BISq faces challenges. It doesn’t have cocktails as a draw. It serves small plates that won’t, for everyone, add up to dinner. (One large-format dish each night might not be a bad idea.) And it is just off the beaten path, at the edge of Inman Square. If customers don’t walk by, they will simply keep wondering whether the soup is any good. Not to knock the green gazpacho, but they will be missing out.